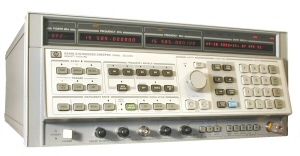 The Agilent 8340B is a synthesized sweep oscillator that is designed to offer a frequency resolution of 1 to 4 Hz. The sweeper features low spurious and allows operators to obtain quick, accurate results. The oscillator operates with a low phase noise, and gives a calibrated output ranging from -110dBm to +10dBm. It is ideal for Amplitude, Frequency and Pulse modulation, which makes the 8340B oscillator a complete analog sweeper and a excellent addition to any calibration laboratory. The synthesized sweeper is designed to offer the functionalities of both a synthesizer and a sweep oscillator. It efficiently allows operators to take advantage of the powerful features of a high-performance synthesizer. The smart design enables operators to apply it as a broadband sweep oscillator. It is also easily controllable using the HP Interface bus. The combination of these powerful features make the 8340B ideal for both manual and automatic testing. It is a suitable replacement of RF synthesizer, sweep oscillator, microwave synthesizer, and frequency counter. Other features of note for the Agilent 8340B include a precise frequency resolution, and outstanding long term stability. The oscillator is capable of achieving a better than 50ms CW switching times. Switching times can be improved by using a programming command. The Fast Phase-Lock command enables the technician to achieve switching times that range between 11ms and 22ms. The CW switching times values are dependent on the absolute frequency value and frequency step size. The oscillator also is designed to offer a high output power. It is possible to control its output power down to aprox -110dBm. This can be achieved with a resolution of 0.05dB. The high accuracy and flatness of this model complement its high power resolution. The complete characterization of devices that are level-sensitive is easily achieved using the oscillator. This basically is accomplished by using its power sweep capability. The dynamic range of its power sweep capability is >20 dB. The high-performance pulse modulator of the Agilent 8340B has a >80 dB ON/OFF ratio. The rise/fall times of this modulator is <25 ns. The amplitude modulation of the 8340B is dc-coupled and its minimum depth is 90%. The unit offers frequency modulation with peak deviations of up to 10 MHz. The sweeper also allows for simultaneous use of amplitude, pulse and frequency modulations. The broad frequency range supported by the Agilent 8340B enables operators to carry out an extensive range of tests. Both narrow and broad analog sweep widths can be achieved. The markers are provided to simplify swept measurements, and to enhance thorough and rapid testing. A variety of marker functions are also provided to enhance this functionality. 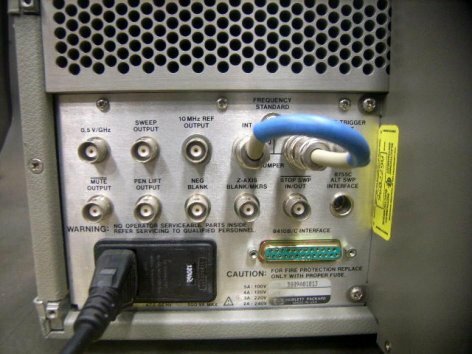 For microwave network analysis, the Agilent 8340B serves as an ideal source when precision testing. It is also extremely adept with both scalar and vector network analysis applications. The oscillator excels with these applications because of its signal purity, stability, and frequency accuracy. Please contact us with questions, or for more info and assistance with choosing equipment for your precision testing needs. This entry was posted in Site News and tagged Agilent 8340B. Bookmark the permalink.